NSW Police have abused their power and in effect directed Facebook to take down a support page for police, former police and their families who are dealing with mental health problems such as stress, depression and to help with suicide prevention. Posts on the page were broad and allowed people with mental health issues to reach out for support while other posts gave families and friends the opportunity to pay tribute to deceased officers. It seems the only reason that the Facebook page (The Forgotten 300) was taken down is that a few posts criticized some serving officers and other posts were critical of the lack of support within the police force for officers and former officers suffering mental health issues. The police have admitted that they had Facebook take down the page (18th March 2016) yet there was no allegation that any crime had been committed or anyone had been defamed. There was no legal basis given to have the page taken down so one has to assume there is none. They say “posts considered offensive and detrimental to the wellbeing of particular serving officers”. Where is the evidence supporting that statement? And where is the concern, when the page was deleted, for the stress and duress suffered by people who used the Ther Forgotten 300 page for support? 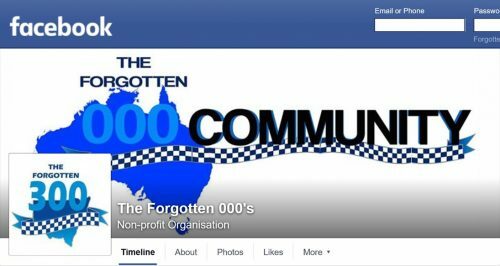 The Forgotten 300 Facebook page had over 54,000 followers and was started in 2012 when the NSW state government capped compensation claims for injured police. The 300 related to the number of officers that were short-changed the compensation they would have been previously entitled to. The page was started by the wife of a former police officer. In 2013 the administration of the page was handed to former police officer Berrick Boland. The Forgotten 300 page was deleted by Facebook on the 18th March 2016 and while it did get some media coverage (Click here to read) it should have been a lot more. Berrick Boland has not sat idle since the page was taken down and another page has been set up called The Forgotten 000’s which has been broadened to cover all emergency services people such as Firefighters and Ambulance Paramedics etc. Mr Boland has also set up a website https://theforgotten000s.com which is still under construction awaiting a first post but will be up and running soon. I interviewed Berrick Boland on Tuesday the 19th April 2016 in the below video. What makes it worse for the NSW police is that they have been shown to be major hypocrites as a number of serving officers were caught on the 10th of April 2016 using facebook to harass a NSW state politician. The Police are now under investigation by the Police Integrity Commission (PIC) which has oversight for the Police. “The PIC confirmed on Thursday that its inquiry, Operation Colchester, would probe allegations of “police misconduct” that arose after March 18″ (Click here to read more) One officer has already been suspended. It is interesting that the date March 18th in the same day Facebook took down The Forgotten 300 page so you would have thought the police would have been vigilant from then on in not abusing people themselves on Facebook. What the police have allegedly said on Facebook about MP Jenny Ledong seems a lot worse than anything the Police have alleged was said on The Forgotten 300 about the police. I think the Police Integrity Commission should also investigate the circumstances behind Facebook deleting The Forgotten 300 page. The government agencies that try and close down Facebook pages and other social media for frivolous and vexatious reasons are doing nothing more than embarrassing themselves and need to change their strategy and accommodate the new media. They need to face up to the fact that the Internet Truth Train is coming and you cannot stop it. This is rapidly getting as bad as the kangaroo courts that do their best to hide their myriad stuffups. Mind you it the truth, the whole truth and nothing but the truth about both police and courts was published, there wouldn’t be sufficient space left in newspapers for the advertizing. The whole reason many honest officers left the force is because of the Pathetic State of affairs high up the chain . Police are being abused for doing the right thing ,bullied and harassed by Senior Police , Sadly just like our diggers they put their life on the line ,then when things go bad they find themselves with no support ,and often no way to survive ,no wonder they suicide . One has to remember that the first NSW Police Officer and quite a few after him were selected from criminals and thieves ,John Smith was his name if you can believe that . As we have seen from many Royal Commissions in particular the Wood Royal Commission the officers at the top Stunk and still do today , I Do Not Consent to this at all and never will, there is so much evidence against So called Good Police that The whole lot need to be looked at closely . Lesson Learned: Don’t build a community or website on facebook. The same scenarios exist in NSW Education. Many good teachers in TAFE have suffered “Psychological Injuries” at work and several have left or else had psychological breakdowns. The government position and that of Heads of Education is that it has not been recorded, they are not aware of it, it does not exist, etc. We have records of member suicides too. In hindsight we all can see each event no matter how minor or major should have been recorded as a workplace injury or WC, but as each individual event came up each individual was given to believe they were a unique case and there were no others. They were therefore psychologically conditioned to believe they were useless or a failure or can’t cut it in this job alongside other stronger people. Several resigned or took early retirement to escape the character damage and psychological damage. There seems to be a Stage Government Executives culture that is not interested in and does not act with genuine empathy or integrity towards aspects of workplace safety and protection in preference to burying anything embarrassing for the sake of their reputations as leaders. This all points to leaders who lack appropriate leadership attributes and will do anything to hide incompetence and maladministration at the expense of employees and even to the cost of the lives of employees. Trouble is those executives have the authority power to do as they please with impunity of their actions from within their respective verticals of the system of government. This should be a wake up call to everybody – if you have not already been awakened. The entire world’s control structure has been taken over (a long, long time ago) by criminals. They do as they please under the cover of secrecy, be it murder, fraud, theft, intimidation, or whatever) often using the control structure they have infiltrated. When the spotlight is shined upon them they change laws to make their crimes “legal”, viciously and frivolously attack the person/people exposing them, notch up their advertising (MSM) to deceive and distract people, and then shut down any kind of reporting on their activities. They quickly and repeatedly tell you that other countries are under dictatorship and their citizens are brainwashed. Funny… it’s only the enemies of West that are accused of this. As soon as a nation is infiltrated and controlled then that nation suddenly becomes “free and democratic”. Yet the evidence is right in front of our eyes for all to see that WE are not free from dictatorship – most still cannot see. It is often too difficult and traumatic for a person to realize that much of what they were trained to believe since they were born is a massive lie. THIS is why the internet and independent media is their enemy. It’s now much harder to control the information (propaganda!) people get. And people are seeing more things, and thus become even more curious. Thank you for writing about the Family Law Courts. I was heartened to see that Brandis has defined John as a mere minion a human being and one to have Hubris sprayed into his humble personifa as would anyone born without a soul without a heart without courage or for that matter a brain when presented with good advise that would cost the vested interest that gets him into power. I am glad that John is being treated in the same manner as us mere mortals. Another email plea 30 September, 2015, ignored by Malcolm Turbull’s Edgecliffe office, there is plenty more coming in the lead up to the election so voters know exactly what kind of contempt the Liberal National Party and the Prime Minister has for our members and their families. The Shameful Truth, ABC 4 corners, 1 August 2016, 8.30pm.